adapated from Chemical Reactor analysis and design fundamentals, Rawlings and Ekerdt, appendix A.2.3. The equilibrium composition of a reaction is the one that minimizes the total Gibbs free energy. The Gibbs free energy of a reacting ideal gas mixture depends on the mole fractions of each species, which are determined by the initial mole fractions of each species, the extent of reactions that convert each species, and the equilibrium constants. The equilibrium constants for these reactions are known, and we seek to find the equilibrium reaction extents so we can determine equilibrium compositions. rerun. For more help, see Choosing the Algorithm in the documentation. options.MaxFunEvals = 200 (the default value). the error message suggests we try another solver. Here is how you do that. % placeholders for other inputs to fmincon. Local minimum found that satisfies the constraints. and constraints were satisfied to within the default value of the constraint tolerance. 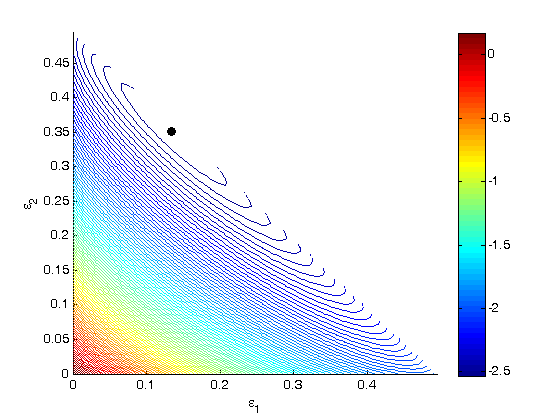 One way we can verify our solution is to plot the gibbs function and see where the minimum is, and whether there is more than one minimum. We start by making grids over the range of 0 to 0.5. Note we actually start slightly above zero because at zero there are some numerical imaginary elements of the gibbs function or it is numerically not defined since there are logs of zero there. % values as a vector. % you can see from this contour plot that there is only one minimum.